Davie, Fla. – September 29th, 2015 – Dental Fix RX, a national mobile dental equipment repair company, has officially signed Eric Pujols, a Hermosa Beach, California-based entrepreneur, as its 220th franchise owner. The agreement marks the twenty first mobile repair van to launch in the State of California, and is Dental Fix’s 46th franchise sale of 2015. To find out more about Dental Fix and for franchise opportunities, visit www.dentalfixrx.com/franchise/. DAVIE, Fla. – Sept. 18, 2015 – In observance of Breast Cancer Awareness month, Dental Fix RX, a mobile dental equipment repair company, will be collecting donations throughout the month of October to benefit breast cancer research. The fundraising program encourages franchise owner/operators across North America to give back and support charities by gathering contributions from dental customers and through personal donations. A percentage of the total earned will also be matched by Dental Fix’s corporate office in Florida. Donors will be given pink branded bracelets and printed collateral highlighting the importance of their contributions. Dental Fix owners will be able to contribute themselves by purchasing specially branded pink work shirts to wear throughout the month. A percentage of the total contributions will then be matched by Dental Fix corporate, while the highest performing owner will receive special recognition at the company’s 2016 franchise convention. 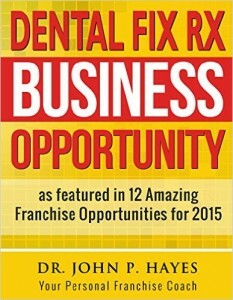 DAVIE, Fla. – Sept. 16, 2015 – Franchise business coach Dr. John Hayes’ popular book, “Dental Fix RX Business Opportunity: as featured in 12 Amazing Franchise Opportunities for 2015,” is now available to download for only $.99 on Amazon.com. “Dr. Hayes’ book features an entire chapter about the Dental Fix franchise model, and now we’re even more honored to say this information is published in its very own book,” said David Lopez, CEO of Dental Fix RX. “We encourage everyone who is interested in becoming their own boss in an exciting and rewarding industry purchase this book today and then leave a review about it on Amazon.”“Dental Fix RX Business Opportunity: as featured in 12 Amazing Franchise Opportunities for 2015” chronicles the benefits of becoming a Dental Fix owner/operator and offers steps to build a successful dental repair franchise. With nearly 14,000 dental customers served in the U.S., Canada and Mexico, the company offers dental clients timely, on-site and customized services that produce quick, yet high-quality repairs. Franchise owners receive all the tools necessary to perform a variety of repairs on dental equipment such as handpieces, chairs, vacuum pumps and more, all from a fully-equipped mobile repair van. The franchise also offers extensive pre and post-launch training with continual sales and marketing support, as well as an industry exclusive, money-back guarantee. Established in 2009, Dental Fix RX is a North America’s only mobile dental equipment repair franchisor. The company’s philosophy is to focus on customized service that produces high-quality repairs in a short amount of time. To find out more, visit http://www.dentalfixrx.com/franchise/. Founded in 2009, Dental Fix RX is North America’s only on-site dental equipment repair franchise. Combining centralized technological and account management services with a unique national network of locally owned and operated industry professionals, the company provides its owners with “state of the art” mobile repair centers to deliver timely and personalized services for all equipment repairs and needs. Franchise opportunities are available nationwide with an exclusive, money-back guarantee for business growth and development. For more information, call 773-255-4095 or visit www.dentalfixrx.com. Davie, Fla. – September 8th, 2015 – Dental Fix RX, a national mobile dental equipment repair company, has officially signed Mahi Paturu, a Plainfield, New Jersey-based entrepreneur, as its 218th franchise owner. The agreement marks the second mobile repair van to launch in the State of New Jersey, and is Dental Fix’s 44th franchise sale of 2015.“2015 has been a record breaking year for us so far, and with each new franchise sale, we are getting closer to our goal of making Dental Fix the top-of-mind mobile dental equipment repair company across North America,” said David Lopez, CEO of Dental Fix RX. “This new signing is an indication that our model is built for success and that our growth is poised to continue at a rapid pace.”Dental Fix continues to be North America’s only on-site dental equipment repair franchise. With nearly 14,000 dental customers served in the U.S., Canada and Mexico, the company offers clients timely, on-site and customized services that produce quick, yet high-quality repairs. Franchise owners receive all the tools necessary to perform a variety of repairs on dental equipment such as handpieces, chairs, vacuum pumps and more, all from a fully-equipped mobile repair van. Extensive pre and post-launch training with continual sales and marketing support is also offered along with an industry exclusive, money-back guarantee. To find out more about Dental Fix and for franchise opportunities, visit www.dentalfixrx.com/franchise. DAVIE, Fla. – Sept. 3, 2015 – Dental Fix RX, a mobile dental equipment repair company, continues to experience record business growth as a result of the standard support offered to all franchise owners. In the last year, the brand has grown its customer base by approximately 6,000 dental clients, while launching more than 50 all-new franchise territories across North America. In order to deliver timely, on-site equipment repairs and services, each Dental Fix franchise owner is provided with all the tools necessary to achieve success, including extensive training and a committed account management team to maintain a successful and flexible work environment. Upon sign-up, owners are assigned a sales support representative and team of account managers who are stationed at the company’s home office. Experienced in marketing new business to area dentists, Dental Fix account managers assist franchise owners with an array of support related functions – from grand opening marketing assistance, contacting dentists to offer monthly services, scheduling and dispatching, routing calls from dental offices to the field and collecting on invoices from services and repairs. With this dedicated support, Dental Fix franchise owners are able to concentrate on other aspects of managing their businesses. Before a Dental Fix franchise owner begins working in a territory, they undergo a thorough, 42-day training program designed develop the technical skills necessary to repair and maintain equipment and market their businesses effectively. Conducted at a state-of-the-art training facility, the program offers real world simulations so that franchise owners can become familiar with both dental offices and their mobile repair centers. Following the initial program, Dental Fix sends trainers to spend an additional five days on-site in each territory to help prepare the franchisees for their daily field operations. In addition, periodic training throughout the year is provided to all Dental Fix owners. “A Dental Fix franchise is the perfect opportunity for entrepreneurs who are interested in becoming their own boss,” said Lopez. “All of our franchise owners are given everything they need to get the ball rolling and we offer dedicated support from trained professionals to ensure that their success is maintained for years to come.” Established in 2009, Dental Fix RX is a North America’s only mobile dental equipment repair franchisor. The company’s philosophy is to focus on customized service that produces high-quality repairs in a short amount of time. To find out more, visit www.dentalfixrx.com/franchise.